LTHForum.com - City Kid Turns Farmhand! LTH Home > Chat > Gardening, Farming and Foraging > City Kid Turns Farmhand! That was the reaction of my older daughter as we closed the video (which worked fine on her snazzy 'puter). Great job and great job for Myles to have. I think it is so vital for us to get a better idea of where our food starts. We all look forward to seeing the next installments. They will be sold at the Lake County Fair at the end of July. We had a long talk about this before he signed up, and before we did it he had to accept that the animals are livestock, not pets, and will go to slaughter. He was very quiet for a while, and finally said, pragmatically, "As long as I don't have to see it." My friend had become a vegetarian shortly before the 4H project, so it didn't change her views, just sent her into a teenaged existential crisis for the entire summer. We have the same experience and issue with fishing (where, admittedly, I make the 'spouse do the actual deed thus far.) I suppose that's why there's an age limit: it takes a certain amount of maturity - I doubt Sparky would be able to keep the distance that's appropriate. For instance, he has a short list of animals he won't eat based exclusively on cuteness - but quickly adapted to allow himself to eat a previously taboo ducky at Sun Wah - the taboo now only extends to cute little quails and ducklings. Still, it's probably the best way there is to remember where our food comes from, and I applaud you for finding a way to teach this to your urban family! Applaud him, not me. He knew what he wanted and forced us to make it (just barely, given the state of the Edens) possible. Last weekend, I was talking to a guy who was raised on a farm (and who now sells pork for Niman Ranch) and he told me that he learned, after a while, that he had to avoid becoming overly fond of his livestock/future food. Myles is obviously learning quickly, and this looks like a superb learning experience (and the lad seems to be enjoying himself a lot). Issues of affection have not yet arisen with my Ermine (who I have yet to meet in person/pig). Mike, it is so funny (sad sort of). I live out in the country, have a barn and pastures, yet no animals. My late husband had the horses, cattle, donkey and chickens. My son (now 16) never had one moment of interest in anything to to with raising animals. He is a computer head through and through. It is nice to hear that city kids can have a chance to experience their interests as well. It was with great pleasure that I finally met up with Mike G and his son Myles at Wagner Farm in Glenview. I arrived in time to see Myles walk his lamb Triska around the farm. Later on this summer when Myles is judged on his animal husbandry, his ability to guide Triska will be part of the evaluation. These walks are educational for both Myles and Triska, because they need to learn to work together. This includes posing the animal for the judges to evaluate his physique. To get a sense of some of Myle's responsbilities toward fulfilling this project are outlined in Showing and Fitting Your First 4-H Lamb. When Myles led Triska on a leesh back to his pen, another lamb darted out. I learned earlier in the week, the horses had knocked down the pen allowing all the lambs to roam free. While Mike and Myles had their challenge stemming off the great escape. I can imagine the fun there was to chase all the lambs scattered all about. 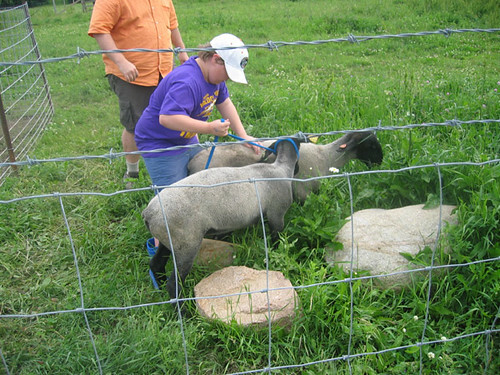 When Myles is tending his lamb, he is also responsible to feed hay, lamb chow and water his fellow 4-H member's lambs. Of course, the parent is an important partner in helping out. 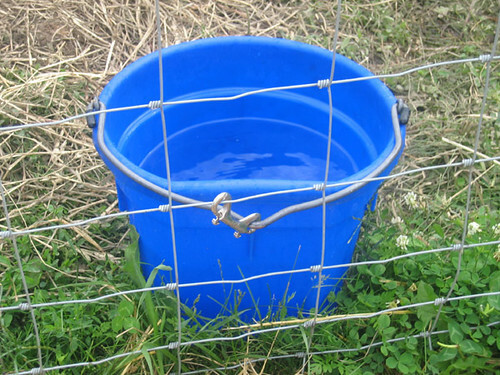 I was impressed by the clasp used to anchor the water bucket to the fence to keep it from tipping. Perhaps an idea that could be borrowed to anchor garbage cans often tipped and invaded by raccoons. 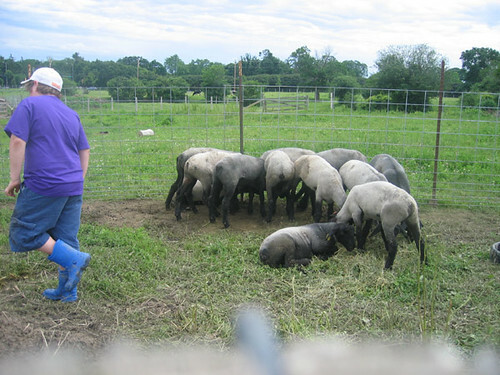 After Mike and Myles left for home, I watched the 4-H leader feed the project pigs. 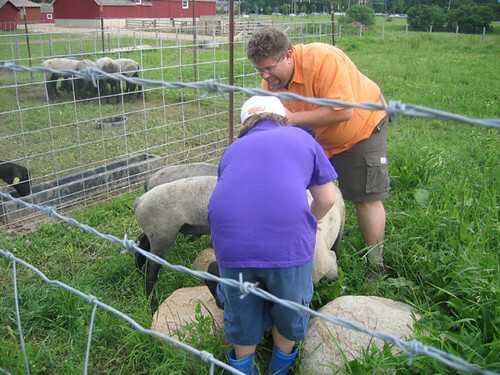 I had learned from Myles there was maybe a $10-$15 increase in cost for raising a pig as opposed to the lamb. Simply watching the pigs moving about in the mud that was up to their knees. I think Myle's Mom missed the laundry challenge of her lifetime trying to keep Myles in clean clothes. I could just imagine Myles having to change clothes before making the journey home. 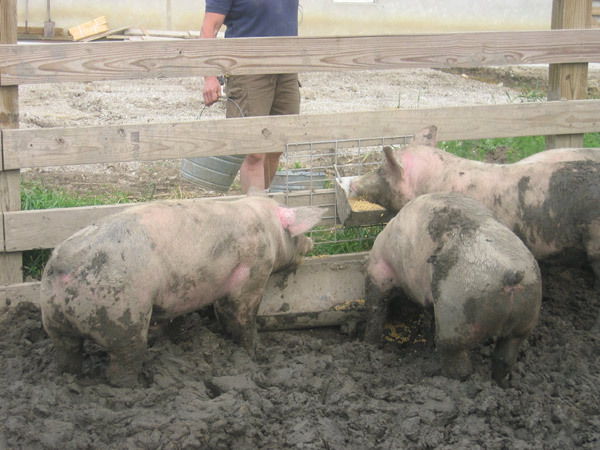 I quiped to the 4-H leader if the pigs walking through the mud caused them to loose weight. She said it actually has the positive affect of strengthening their legs and improving their muscle tone. Looking through the foodie looking glass, does this mean a better ham? 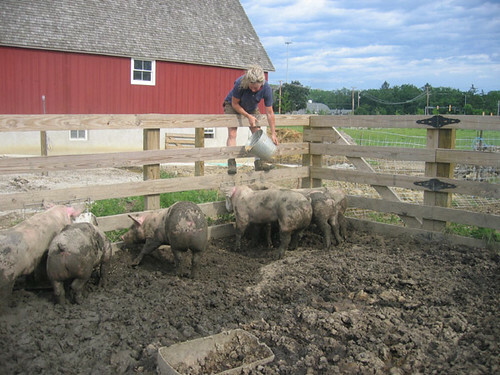 These pigs get fed, exercised and have sunblock massaged into their skin. They also get walked about like Myle's lambs, because this is a necessary skill for showing them at competition. I just checked the Lake County Fair schedule. The judging of swine and sheep will be at 9 AM on July 24th, which could be quite interesting to see. The auction will begin at 1 PM on July 26th. The auction has quite of bit of interesting people watching from marriage proposals to animals simply not cooperating to the surprisingly high (and low) prices these animals auction. If you go to the cafeteria, you can see the highest bidders memorialized on the walls. Yes, there are prizes given to those who spend their money wildly. Pritzker's have a farm in Lake County and they usually are mentioned. If you want an opportunity to taste the pigs, then go to St. Mary's annual pig roast the weekend following the Lake County Fair. I will post it on events as we approach. I have judged 4-H culinary competitions in the past. The initial phase of judging is the child's completion of his project. If he did everything that was expected, then they get a blue ribbon. If they did most but could still need improvement, then they get a red ribbon. If they need substantial improvement, then a judge can offer a white ribbon or none at all. At the child's option, they can be interviewed by the judge before a final ribbon decision is made. All blue ribbon projects in a class are then judged and ranked for champion and alternate champion. All the champion projects are judged and ranked for Grand Champion and Runner up Grand Champion. The judges also select which children's projects go to State Fair as well as alternates, though the kids need to be at least 10 years old to ber considered. The kid learn a lot of life skills if they work through all their project requirements from data collection to presentation skills. I wish Myles well on this experience of a lifetime as well as his parents. Thanks for the pictures, Cathy. They brought a tear to my eye. Knowing Myles to be a person with a gift for self-expression, he might do well to ask for that interview with the judge! He might be able to sway a close decision in his direction. I suggest a two prong approach: visit the farm at Lake St and Wagner Road in Glenview, especially if Myles will be there. Watching him take the lamb for a walk and other chores is of interest. You do run the risk Sparky might want to do the same. According to the Lake County Fair book, judging is Thursday, July 24th at 9 AM, though what time is lambs is not known to me. The auction is Saturday afternoon, which can be interesting as well. At noon on Sunday 7/20, we will be at Wagner Farm for the (gulp) last time. The lambs leave Wagner Farm for the fair on Monday. They'll be there all week. The auction is some time on Saturday. You can come by any time up to Sunday (7/27) to see Triska, not sure when we will be there. Sadly, I had to miss it because I'm on @(#$^#&! jury duty, but Myles' lamb Triska was judged today... and they won second place in the lightweight division. He got to go on to the finals, so he is just beaming with pride. He also received blue ribbons for three of his art projects, and a red ribbon for his rocket (he didn't sand the fins enough). Blue doesn't mean first place, but it means first class, red means needs improvement, white means needs a lot of improvement. So he is very excited to come home with a stack of mostly blue ribbons this week. 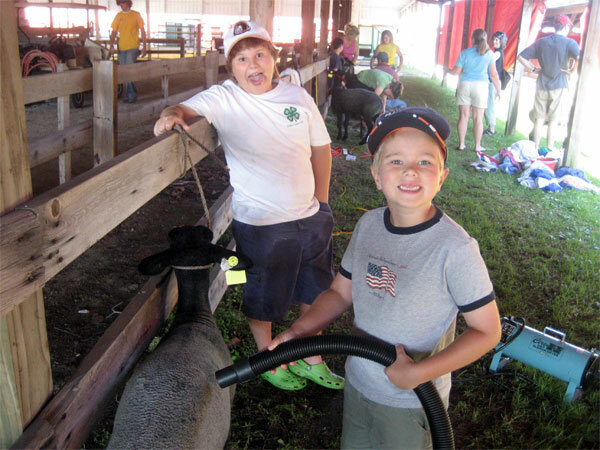 You can see his lamb and artwork, enjoy a corndog, ride the scrambler, and have an all-out good time this weekend at the Lake County Fair. Recommended. Myles and the first-place winner showing their lambs for the judges. Thursday (tomorrow), I was told the open show judging for the sheep will be "after lunch". I don't know if it is the sheep barn like today or in a different arena. 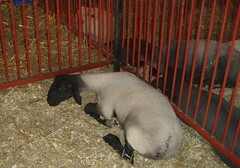 Saturday: Livestock auction at 1 p.m.
Myles' sheep is one of the Glenview Clovers sheep now resident in the Sheep barn. 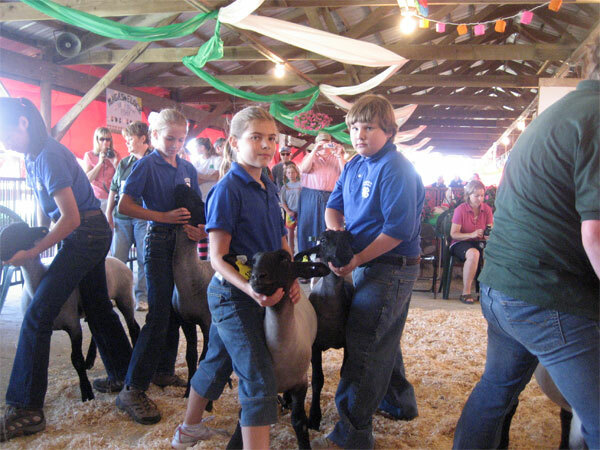 Every 4-H kid has a wonderfully supportive family to help make it happen. Congratulations to Myles and his family! Last chance: livestock auction is today at 1. Thanks, Mike - our only window is tomorrow, so we're going to go then...maybe we'll see Triska milling around with the other sheep...good luck at the auction! 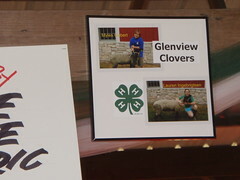 Look in the Sheep barn for the Glenview Clovers area, then look up at the photos of the kids with their lambs and you'll find Myles with Triska. He's black head, gray body; I think the other two in the same pen are more black all over. Triska's ear tag has the number 13 on it. Actually it doesn't now. They changed them for some reason relating to the fair, I assume. I just checked the photos Susan took the other day, it's now 141. As before, if it sputters while playing, pause it and let it load all the way. What a great memory from his childhood to be revisited many times in the future. Thanks for documenting this event. I look forward to the short film on the dog. Good video. Reminds me of my days outside Cleveland when my company had a $3-4k budget to buy 4-H animals. You buy the animal, send it to the local food pantry and in at least a couple of cases, get pounds of fudge from the kid you bought the animal from. The Boone Co. Fair starts in seven days and is probably the best fair in this area both in size and quantity of animal life. 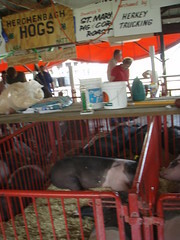 of all the fairs, this has some of teh best food around - fresh donuts, pork chop sandwiches, etc. 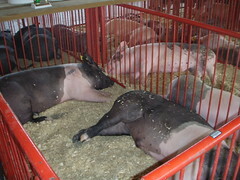 the McHenry Co. Fair starts this weekend but it is NOT worth the effort to get to. Last edited by jlawrence01 on July 29th, 2008, 7:19 am, edited 1 time in total. Yeah, Myles and Liam are somewhat in denial about what happens to the animals, or at least this one, even though you can plainly hear the words "food pantry" on the video at the end of the auction.